CCXMarkets is an offshore Forex & Stocks CFD broker that opened on March 20th 2019. Owned and operated by Online Media Solutions LTD, CCXMarkets is located at: Griffith Corporate Centre, Suite 305, P.O. Box 1510, Beachmont Kingstown, St. Vincent and the Grenadines. Customer support email address is: support@CCXMarkets.com, and the phone number in Switzerland is: +41449746966. 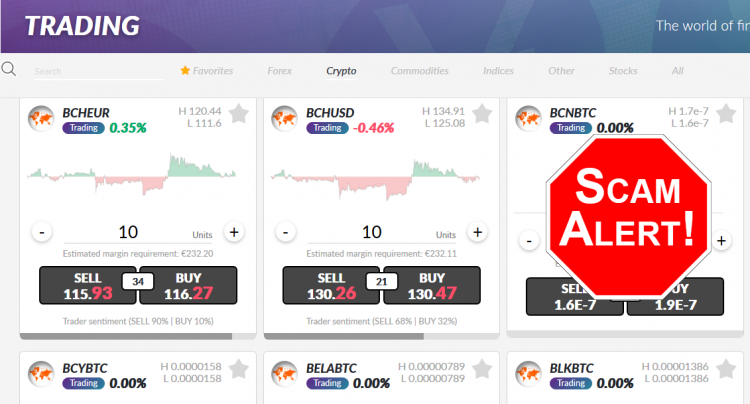 Their official website is at: https://www.ccxmarkets.com/. For complaints and withdrawal problems, read this article. Our review of CCXMarkets shows that they offer their clients the Leverate Activ8 web-based CFD trading platform. This trading software is very easy to use and simple for beginner investors and day traders. You can select the leverage amount you would like to use, your Stop Loss, and Take Profit amounts. Also available is the generic Activ8 Mobile App for iPhone and Android. There are hundreds of underlying assets available for CFD stock trading. All major and minor currency pairs are available, plus you can trade Crypto Currency CFD’s on Bitcoin, along with CFD’s on shares of Cannabis Stocks. Minimum deposit requirement for a CCX trading account is at $250. Leverage is available of 1:200 on BTC/USD, but their spreads are $100 wide. You can find brokers with tighter spreads, see here. Do not use an algorithm trading software, until you read this! Your trading account is not secure, because the software can access to it. At this broker, they offer new clients a 20% – 100% welcome bonus when you open an account. Newbie investors who have never traded CFD’s before, should read the terms and conditions, before accepting a bonus! Most brokers require a large trading volume, before you can withdraw your money. We have received many complaints from traders about withdrawal problems, which comes because of bonus money. Is CCXMarkets a Regulated Broker? No, CCXMarkets is not a regulated or licensed broker. Scam Broker Investigator has reviewed more than 500 hundred online brokers, to see if they are a legitimate brokers or potential scams. The most important thing that investors check for at a broker, is a license from the government. If your broker is licensed, then your money is usually insured by the government regulator, and held in segregated bank accounts. If you are interested in investing with a licensed stock broker, go look at the list of regulated brokers, look here. Most new investors will choose an established Forex broker, before using an offshore broker. ForTrade are the best brokers for new investors, since they are licensed in Australia and England, look here. Start with a Free Demo Account on their award winning trading platform, signup here. If you are currently investing at the broker CCXMarkets, Please share your experience with this broker in the comments section below.